You can earn quadruple points at these select hotels for stays between September 1 – October 31, 2016 that are booked this September. Remember that you can (usually) combine these quadruple point offers with other bonus promotions that may be out there. 1. 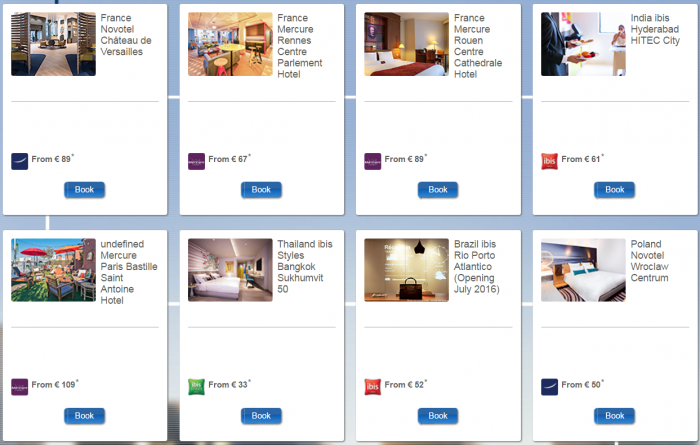 General Le Club AccorHotels terms and conditions apply to the “New Participating Hotels x4” offer and you must be a Le Club AccorHotels member to benefit from it. 2. This offer entitles Le Club AccorHotels members, regardless of their membership status, to benefit from earning bonus points x4 for a stay in one of the participating hotels in the Le Club AccorHotels Loyalty program. The number of bonus points earned for this offer are calculated based on a Classic membership status level earn rate. 3. This offer is valid for a member’s stay from 01/09/2016 to 31/10/2016 in one of the participating hotels (Ibis Styles Goa Calangute, Ibis Hyderabad Hitec City, Ibis Styles Bangkok Sukhumvit 50, Novotel Wroclaw Centrum, Ibis Leipzig City, Mercure Rouen Centre Cathédrale, Mercure Paris Opéra Lafayette, Mercure Compiègne Sud, Mercure Poitiers Site du Futuroscope, Mercure Rennes Centre Parlement, Novotel Château De Versailles, Novotel Paris Nord Expo Aulnay, Novotel Paris 17, Mercure Côte Ouest Les Sables D’Olonne Thalasso Et Spa, Mercure Paris Bastille Saint-Antoine, Ibis Rio Porto Atlantico, Novotel RJ Porto Atlantico), and booked between 01/09/2016 and 30/09/2016. 5. Any consecutive stays (check-out and check-in same day) in the same hotel, will be considered as a single stay. This single stay will be eligible once on the “New Participating Hotels x4”. Previous articleAir India: Drunk Pilots Have To Pay For Retraining After Second Offense – First Offenders Get Off Scot Free?